Chemo round two was characterized by one overwhelming reality…your sweet, precious days of carefree childhood have changed. After 35 days of being attached to an IV pole, you were frustrated. The nurses decided to give you a break one evening and disconnect you from your IV pole. With your newfound freedom, we ventured across the street to McDonald’s. You loved it. You laughed and skipped and jumped. Joy bubbled up from your spirit and a big smile exuded from your face. You were talking about our trip to the Frio River a few months back. “Yes,” I said, “remember how your cousin Danny saved our lives. We were going so fast, me and you, down that rapid, and we were about to crash into that giant tree, and Danny rescued us. And you, Taylor and Tyler were snorkeling. Looking for coins. And the water was so so cold!" You nodded your head and wiped the tears from your face. A small smile came to the surface. You grabbed your favorite pink blankie and began noodling it between your fingers. Calmly, you laid your head against my chest. I kept talking about our trip and rocking you until you fell asleep. In this moment, I realized the extraordinary value of our freedom! 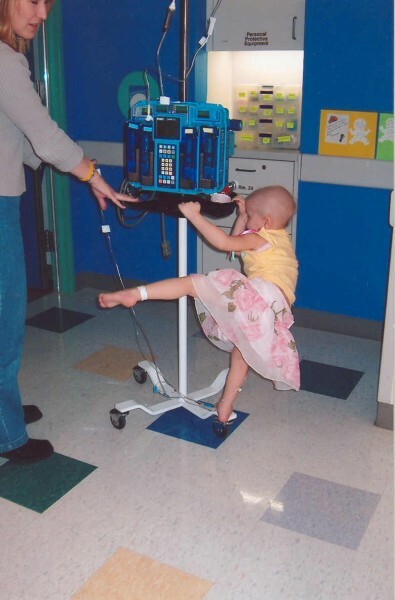 My sweet Brooke, you just wanted to be free…to be able to walk out of your hospital room and do fun, kid things. You wanted to think about something whimsical and adventurous. To remove yourself from your present reality of iv lines, medicine, chemo, spinal taps, x-rays, and on and on. You simply wanted to be a kid! For the next week, you continued to struggle emotionally. But, your family responded. It became our new mission to make the hospital as fun as possible. Your Aunt Zelle came to the rescue! One evening, she barged through the doors with bags and bags of stuff. You were intrigued by her mystery bags. The two of you commenced to decorating your IV pole like a lady. Complete with a styrofoam mannequin head, a wig, a sombrero hat, and a long colorful skirt. You loved her! Aunt Zelle even taught you a song. “You get the line, and I’ll get the pole, and we’ll go fishing at the crawdad hole, baby!” You laughed and laughed. Finally, a release. You would unplug your “iv-lady” from the wall, wrap the cord around your arm and take her for a walk down the halls of the cancer unit…all by yourself. You were feeling more independent and more in control of your “new” world. A few days later, Aunt Zelle again busted through our doors. On her shoulder was a Pink-Barbie-3-Wheel Bike! Just for you. And to help with all the pink, Aunt Zelle attached Spiderman stickers all over your new ride. Now, you unplugged your iv-lady, hopped on your new bike, and off you went. This time with all of us in tow. Chasing after you…pushing your iv-lady as fast as possible as you rounded each corner on two wheels. You laughed hysterically! A new world began for you. Our hospital room was not just a hospital room, it was transformed into a dark dungeon, a princess castle, a school room, a dance floor, but mostly, a battleground where the handsome Prince(Granny) rescued the beautiful princess(you, of course) and your lovely sister, Happia (Nanny) from the fierce Monster(Granny)! As we pack and leave for the hospital again today. I cry a little because I like it here. My sister is funny. She makes me laugh. We love and hug and make each moment last. We dance and play dress up. She makes my days sunny. As they prepare my IV pole and Chemo for each day. You can’t hardly run, jump, dance, or hide. I laugh and laugh cuz I’m out-of-sight. And nurses run too in response to their call. To take medicine and mouthwash and wear my face mask. Spiderman likes it best that is what he says. “I know what it is to be in need, and I know what it is to have plenty. I have learned the secret of being content in any and every situation, whether well fed or hungry, whether living in plenty or in want. I can do all this through him who gives me strength.” Phil 4:12-13 ???????? Enter security code from image.